Recently, a friend of mine Karen, posted on FB that her six-year old niece had been diagnosed with leukemia. She posted a photo of the happy-go-lucky six year old, and was asking friends if they would collect some hats for her, because very soon, she would be loosing her long, blonde hair from her chemo. I quickly scanned my mind trying to think if I had any hats to donate. (I don't. I never wear hats.) I continued rolling through my FB feed when, two of my friends had just posted photos of their latest knitting projects. UREKA! I had idea! 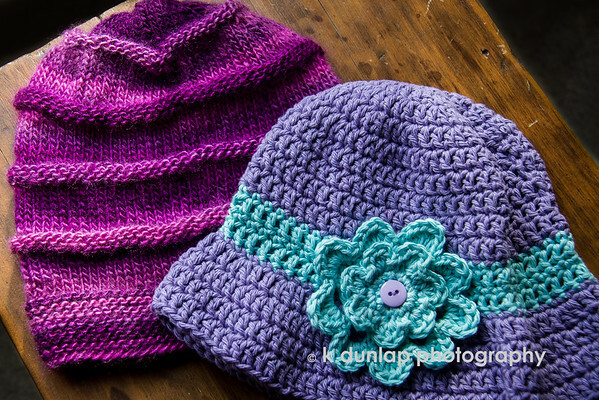 I sent a private message to my two knitting friends, Jennifer and Jane, to see if they would be interested or even have the time, to knit a hat for a six year old girl battling cancer. Within minutes, BOTH of them happily and whole heartedly, said YES. Today, I finally met up and had lunch with Karen to give her the hats. She LOVED the hats and is so very grateful and deeply touched by their kindness. Interesting; neither Jennifer or Jane posted a photo about this latest project, so I want to publicly thank them. Thank you Jennifer and Jane for sharing your wonderful talents, you've made a difference that really counts. That's so sweet. Prayers to are little one.